USA Hockey provides National Camp opportunities for U.S. citizens that are the best of the best. The player identification process starts at the local Affiliate level where players participate in tryouts and if selected move on to the district tryouts. Those players who are selected at the district level then have the privilege of attending one of the USA Hockey summer development camps. National Camps are available for 15, 16 and 17 year old players. 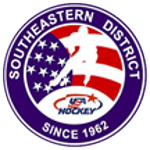 In addition, the Southeastern District holds a camp for the top 14 year old (rising second year Bantam 14U) players in the District as an introduction to the USA Hockey development program. Additional questions? Please contact Ed Morris, CAHA Player Development Director.